The Managers of Bioeconomy Capital are globally recognized experts in technical and economic analysis. We are also experienced engineers, scientists, strategists, and entrepreneurs. We put this deep knowledge to work to identify the best new companies and to help them thrive in a rapidly evolving marketplace. The following figures are technical and economic metrics, updated through 2017, that we developed and that we use in making investment decisions. All images are covered by a Creative Commons Attribution-NoDerivatives 4.0 International license. License and use details are at the bottom of the page. Figure 1. Left: Snapshot of 2016 U.S. biotechnology revenues. Based on differing product development costs and timelines, including regulatory approval, revenues from biotechnology naturally segregate into three different subsectors; biologics (drugs), crops, and industrial products (including tools). For more details on methodology, see our peer-reviewed analysis, based on data through 2012, in “Estimating the biotech sector's contribution to the US economy”, Robert Carlson, Nature Biotechnology, 34, 247–255 (March, 2016). The original data and analytical code used in the published analysis are posted on Github. Right: The industrial biotech revenues are based on data from Agilent. We have adjusted Agilent's reported biofuels revenues to remove the cost of corn, which would otherwise be double-counted in the crops segment. 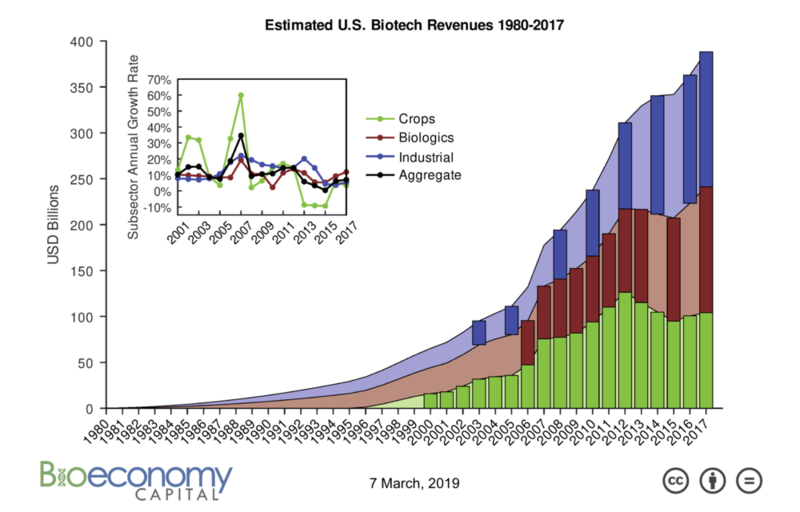 Note that these revenues are business-to-business only, and are therefore an underestimate of the consumer level economic impact of industrial biotechnology by 10-30%. Figure 3. U.S. business-to-business Industrial biotech revenue by component (Source: Gary Carter, Agilent), adjusted to remove the cost of feedstock corn from biofuels revenues. Per Darlene Solomon, senior vice president and CTO of Agilent, the “industrial biotechnology market analysis was developed via analysis of corporate financial reports, equity analyst reports, private consulting firms reports, and third party market research reports” (personal communication). No further description is available at present. Notably, biochemicals significantly exceed fuels in their contribution to industrial biotech revenues. The estimates presented here suggest that biochemicals may already generate the equivalent of ~0.5% of the U.S. Gross Domestic Product, compared with ~3% for petrochemicals. Bottom: Market penetration of five GM crops in the U.S. Note that farmers' adoption of new crops can be rapid; GM sugar beets reached >95% penetration just two years after regulatory approval. Figure 5. The estimated contribution of biotechnology revenues to U.S. GDP and GDP growth from 1980 to 2016, based on data and a numerical model (Sources: U.S. Department of Commerce, Bioeconomy Capital). Top: Absolute percentage of total GDP contributed by biotechnology and percentage of total GDP growth contributed by growth in biotechnology. Note that the biotechnology industry appears to be more stable than the economy as a whole, and during the recession beginning in 2007 the industry contributed 4%-8% of total economic growth. The 2009 contribution to growth datum is omitted because the U.S. economy contracted that year. Bottom: Absolute biotechnology revenue growth and U.S. GDP growth from 1980 to 2016. In 2003, Bioeconomy Capital co-founder and Managing Director Dr. Rob Carlson published the first observation of exponential improvements in reading and writing DNA, and his subsequent analyses are widely cited across academia, industry, and government. In 2006, The Economist magazine dubbed these the “Carlson Curves”, and put their importance for biology on par with Moore's Law for semiconductors. After 20 years of quiet development, these exponential improvements in biological engineering are now poised to re-make large portions of the economy. Figure 7. 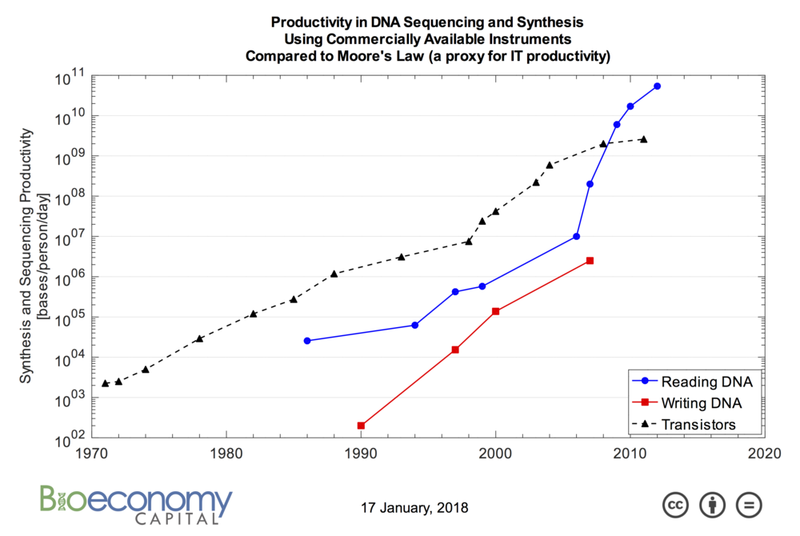 The productivity of DNA synthesis and sequencing, measured as bases per person per day, using commercially available instruments, and compared to Moore's Law, which is a proxy for IT productivity. Productivity in sequencing DNA has increased much faster than Moore's Law in recent years. Productivity in synthesizing DNA must certainly have increased substantially for privately developed and assembled synthesizers, but no new synthesis instruments, and no relevant performance figures, have been released since 2008. Share — copy and redistribute the material in any medium or format for any purpose, even commercially. All other content ©2018 Bioeconomy Capital.